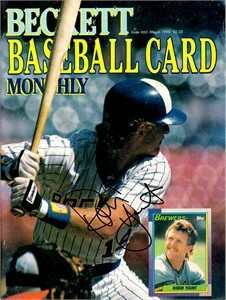 1990 Beckett Baseball magazine cover ONLY autographed in black Sharpie by Milwaukee Brewers superstar Robin Yount. With certificate of authenticity from AutographsForSale.com. NOTE: cover has minor to moderate flaws and wear but is still suitable for framing. ONLY ONE AVAILABLE FOR SALE.